Bio: Lara Scouller graduated with a BA (Hons) Fine Art, Duncan of Jordanstone College of Art and Design, Dundee, 2006. She has been a busy artist since then, with three solo exhibitions to date, and numerous other shows including the prestigious Mall Galleries, London – The Pastel Society 2007-9; 2013-2014 (where she won the the Pastel Society Young Artist Award in 2013); and the Royal Glasgow Institute of Fine Arts, 149th, 150th and 151st Annual Exhibition. Lara has been featured in many publications, including The Artist Magazine, April 2014; and the Wildlife Art Special, Artists and Illustrators, Nov 2013. Most recently her work was showcased in the Pastel Journal, February 2015. Lara says: My fascination for zoological museums began when I was awarded the John Kinross Scholarship to Florence in 2006. It was there that I stumbled upon the Museo La Specola. Although some of the objects on display were slightly macabre, a large number of the specimens caught my attention and laid the foundation for a continued fascination with this subject matter. Since then I have travelled extensively in search for similar subjects including several lengthy stays in Tring which houses one of the largest ornithological collections in the world. Closer to home I have found Kelvingrove Art Gallery and Museum, the D’arcy Thompson’s Zoology Museum in Dundee, Aberdeen’s Zoology collection and lately St. Andrews Bell Pettigrew Museum to be rich sources of material. Lara has also been in Dublin to visit the Dead Zoo (aka the Natural History Museum) and the Natural History Collection Research building in Beggar's Bush. Navigation: A Wordpress website. Clear, clean website. Image View: Thumbnails enlarge in a viewer on the same page, where they are labelled; they may be downloaded. 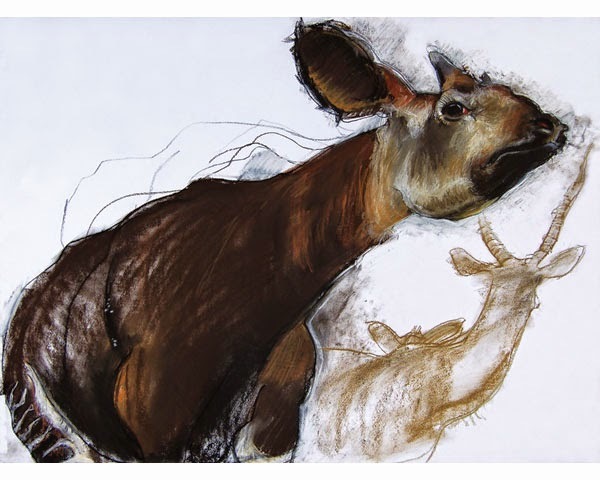 Her pastel Okapi (21 3/4 x 30 ¾), won the Plein Air Prize and Millers The City Art Shop Prize at the Paisley Art Institute, Scottish Drawing Competition 2007. Bio: Helen Norsigian Rowles was born in East St. Louis, Illinois, to first generation American parents of Armenian descent. Her Armenian cultural roots both shaped and influenced her childhood. Helen's mother was an artist and the St. Louis Art Museum was a frequent outing for the family, just across the Mississippi River. The first major exhibit Helen saw as a child was a retrospective showing of Van Gogh's paintings that has remained clear in her mind to this day. Helen received a BFA from Arizona State University in 1983. Through college she painted scenery for The Lyric Opera Theatre and participated in several group showings. Helen was awarded a Board of Regents scholarship based on her portfolio and after graduating, she worked as an interior designer, and as a freelance artist painting and drawing portraits, illustrations, and murals. Helen received her MA (Ed) from the University of Phoenix in 2008 and currently enjoys teaching studio art classes to adults at the Mesa Arts Center. 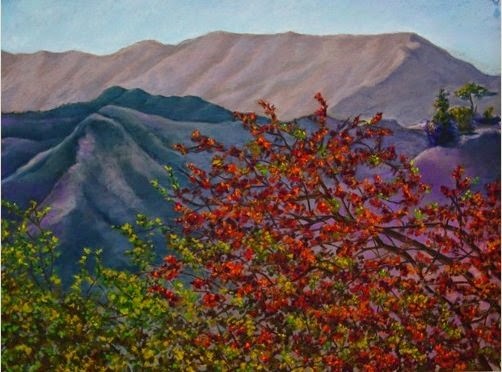 Helen had her first solo exhibition in 2002 at the Armenian Cultural Center in Scottsdale, and has exhibited consistently since then. She has one numerous awards including Daughters of the American Revolution Outstanding Achievement in the Arts Award, in 2013. She is a member of the Colored Pencil Society of America, the Arizona Art Alliance, the Mesa Art League, the East Valley Artists Guild, and the Arizona Pastel Association. Navigation: Not a difficult site to navigate, although there is inevitably some overlap in the galleries, which all remain accessible from any page. Gallery: In my world; Pastel; Scarves of Heaven; Figurative; Still Life; Graphite; Landscape; Animals. Image View: Thumbnails enlarge in a viewer, where they are labelled; they may not be downloaded. Hollywood is 18 x 24 ins. Demo: Yes, look under Technique.